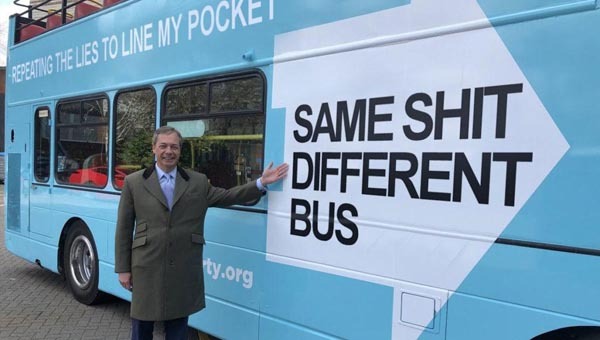 Don't forget Farage promoted it. So what does that tell you about his political judgement? He would be better off joining the rest of UKIP's missing links in the nearest tree. 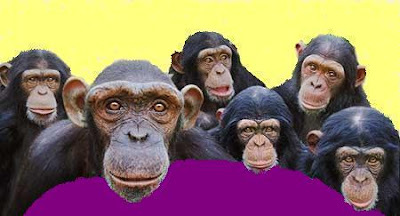 Nigel is the second monkey from the left. The long running debate about ill advised alliances in the European Parliament came to a head at a press conference sponsored by the UK Independence Party (UKIP) and their Italian Allies the Lega Nord to promote a book claiming that the Bilderberg Group is steering the world from behind the scenes. That UKIP were visibly distancing themselves from the author Daniel Estulin came as no surprise. Having invited him to a guest appearance in the European Parliament they clearly had thought twice. The press officer of the Europe of Freedom and Democracy Group (EFD) had to be ordered to take his place on the platform. What followed can only be described as bringing the European Parliament into disrepute. José Manuel Barroso, Jean-Claude Trichet and Herman Van Rompuy were described as “not only traitors of their people and nations, but of humanity as a whole”, by author Daniel Estulin. His presentation underscores the way the European Parliament’s rules have pushed otherwise reasonable delegations of national politicians into unsound alliances - for the money and facilities. Estulin had some choice words to say about certain EU officials and world leaders whom he identified as belonging to the Bilderberg group. He described Commission President Barroso as ‘absolutely intellectually challenged’ and Herman Van Rompuy as ‘evil and very dangerous’. Indeed, any world leader whom he sees as a member of the Bilderberg group (this includes German Chancellor Angela Merkel as well as Nicolas Sarkozy) is considered to be “hardly human”. The most shocking aspect of the press conference were the names attached to the flyers and posters around the Parliament. The speakers billed included the co-president of the EFD group Nigel Farage MEP and Godfrey Bloom MEP. While Mr Farage was unable to attend due to injuries resulting from his plane crash in May, he was nevertheless used to promote the event. The only other UKIP MEP billed to support the author, Godfrey Bloom, also failed to attend due to ‘personal reasons’. The only MEP to attend the press conference was Lega Nord member Mario Borghezio who trumpeted his ‘outing’ of Herman Van Rompuy as “a Bilderberg member” at a Plenary in Strasbourg. The press conference could perhaps best be described as a farce with journalists clearly struggling to contain their laughter and the EFD press officer visibly fuming throughout Estulin’s confusing rant.